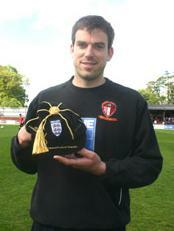 Pictured left, Steve Perkins with his newly presented England Futsal cap. 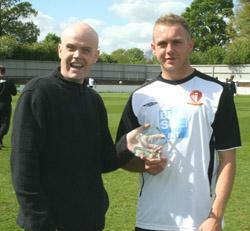 Pictured Right, Will Hendry is presented with his FC Video goal of the season award for his winning strike against Havant & Waterlooville by regular interviewer "Teahut". Hayes & Yeading United ensured they moved into the play offs on the back of a fifteen match unbeaten streak when they came back to win after a shock 3rd minute opener from the visiting Rocks of Bognor Regis Town. 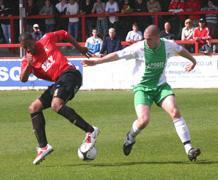 With manager Garry Haylock fielding an almost full strength side, it was to be the Rocks who were to take the lead. Fine work on the right flank saw a cross come in from Kane Wills, Toby Little mis-judged the bounce and the ball fell to Nathan Lynch, his point blank effort was superbly blocked by Aaron Howe only for Rocks skipper Seb Wallis-Tayler to slide the ball into the open net. It could have been worse for United just minutes later when another Wills cross found Lynch again but this time the strikers header was off target. Will Hendry fired over for United from the edge of the Rocks area before another chance came the way of the visitors when Wallis-Tayler laid the ball back to Danny Smith but Howe was equal to his shot from the edge of the area. United then began to dominate the proceedings but still had to wait 25 minutes before drawing level. Chances came and went for the home side, Ram Marwa saw his attempt from 20 yards bounce off the chest of keeper Anthony Ender only to be gathered and then Dale Binns cross on the run found Josh Scott but his effort was also kept out by Ender at the second attempt. Still inside the opening 20 minutes, Danny Allen-Page crossed to Scott who saw his header glance off the top of the Rocks crossbar and then Little found Marwa but he shot weakly at Ender. The 33rd minute was to provide a prelude to the equaliser when Matt Ruby headed a Binns corner over the bar. Just three minutes later that exact same combination saw the big centre-back rise to plant a header towards the top corner that Ender could only help into the net (below left). Far from being down at conceding, the Rocks were soon going forwards again with Wills forcing a fine tip over from Howe. The half did however close with another United chance, Scott was brought down on the edge of the area and Hendry's free-kick forced a fine diving save from Ender. As you may expect, the second half had none of the cut and thrust of the first as already relegated Bognor were playing for pride and United were keeping as much as possible in the tank for next weeks play offs. First strike came from United when James Mulley surged forwards and fed the ball in to Scott, his right foot shot being too high to trouble Ender. Next to try his luck for the home side was Binns whose shot was blocked by a defender in the six yard box and then Ruby got his head to an Allen-Page cross but Ender caught easily. Fifteen minutes remained and it was almost advantage Rocks, Louie Castles broke on the right and centred to Jahson Downes whose shot was deflected wide by a last ditch tackle from Marwa. Two minutes later United took the lead for the first time, Mulley played the ball to Scott who wriggled away from both Andy Pearson and James Crane on the byeline before firing past Ender from the acutest of angles. Taking the lead gave the gaffer the chance to withdraw his front men, replacing them with Scott Fitzgerald and Staforde Palmer and it was to be the latter who sealed the victory deep into stoppage time. Another forceful Mulley run from the back saw him find Palmer on the edge of the area, his well placed shot from the edge of the box beating Ender's dive to nestle in the bottom corner of the Rocks net. Two more presentations are pictured below. 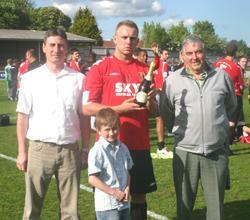 On the left is the sponsors Man of the Match award beging made to Will Hendry. 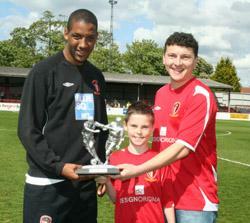 On the right is the award to Josh Scott who was today named the Supporters Player of the Year, the award is being presented by regular supporter Chris Stephens and his son Ben. Ruby (36), Scott (77), Palmer (90+3).